The DVSA has begun checking lorries for emissions cheat devices in a bid to crack down on illegal AdBlue systems that circumvent emissions rules. A lorry with one of these cheat devices installed can produce up to 20 times more dangerous emissions, which contributes to poor air quality and exacerbates conditions such as asthma and even strokes amongst vulnerable groups. During a year-long pilot, DVSA enforcement staff caught 449 emission cheats at five sites across the country. 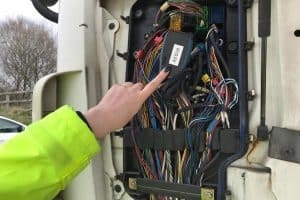 Any drivers found with an emissions cheat device or a faulty emissions control system have ten days to remove the device and repair their emissions system or face a £300 fine and even have their vehicle taken off the road. Furthermore, the offending company could have its operating licence revoked. The DVSA’s priority is to protect the public from unsafe drivers and vehicles, said the authority’s chief executive Gareth Llewellyn. “A vehicle doesn’t have to be falling apart to be unsafe,” he explained. How do cheat devices work? Cheat devices cut the cost of operating and give false emissions readings, resulting in the release of excessive emissions into the atmosphere. There are several ways a cheat device can function. Some prevent emissions control systems from working properly or use cheap, fake emission reduction devices or diesel exhaust fluid. Others use illegal engine modifications which result in excessive emissions. Removing the diesel particulate filter or bypassing the exhaust gas recirculation valve is another known method.